Did you miss the Jan. 27 Tech Tips Live! about Zoom? The first Tech Tips Live! session was Jan. 27 and delivered via Zoom webconferencing by Shelley Troyer, Information Technology Assistance Center. There were 43 participants in the session. This session covered Zoom topics that you might not be familiar with, such as co-hosting, breakout sessions, and running a webinar. All Tech Tip Live! sessions are recorded and on the Tech Tips Live! website. A schedule of upcoming sessions is also on the website. Shelley Troyer, iTAC, will present the first Tech Tips Live! 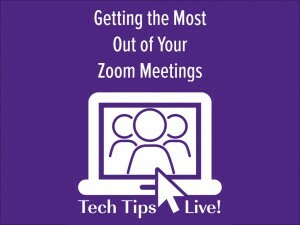 15-minute session on Getting the Most Out of Your Zoom Meetings, 3 p.m. Wednesday, Jan. 27. 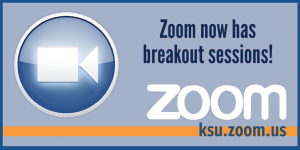 Go to ksu.zoom.us/j/738417925 and be sure to join the session a few minutes early so you don’t miss any of this 15-minute talk. Questions about the topic or how to connect to Zoom? Contact Shelley Troyer (shelleytroyer@k-state.edu). Feeling lost in the ever-changing technology at K-State? Join Information Technology Services at 3 p.m. every Wednesday for our new Tech Tips Live! series offered via Zoom webconferencing. The sessions will be 15 minutes, and you don’t need to leave your office. Take this opportunity to learn more about various ways to use technology at K-State.